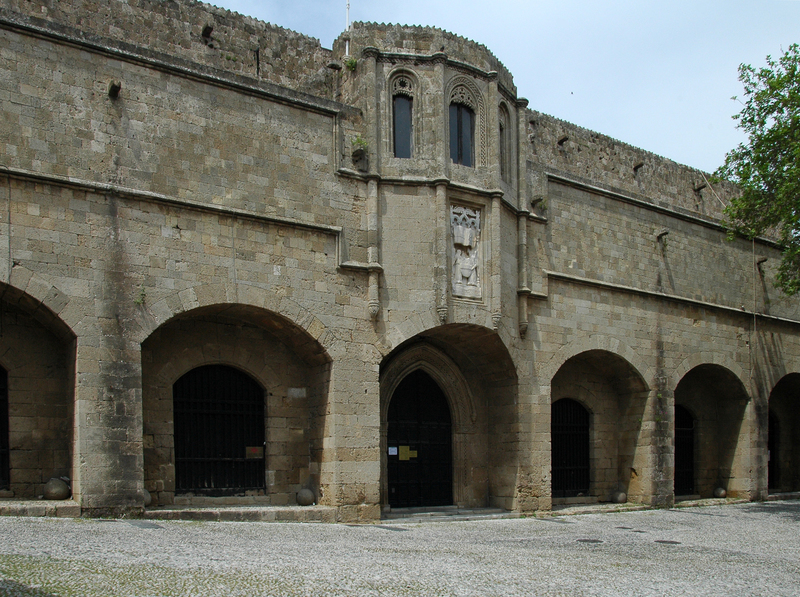 Hospital of the Knights of St. John (Nossokomío lpotón)(fifteenth century) is one of the most interesting buildings of the old town and one of the jewels of Rhodes . The old hospital of the Knights is located down the Street of the Knights , on the south side of the square Moussiou (Museum Square). 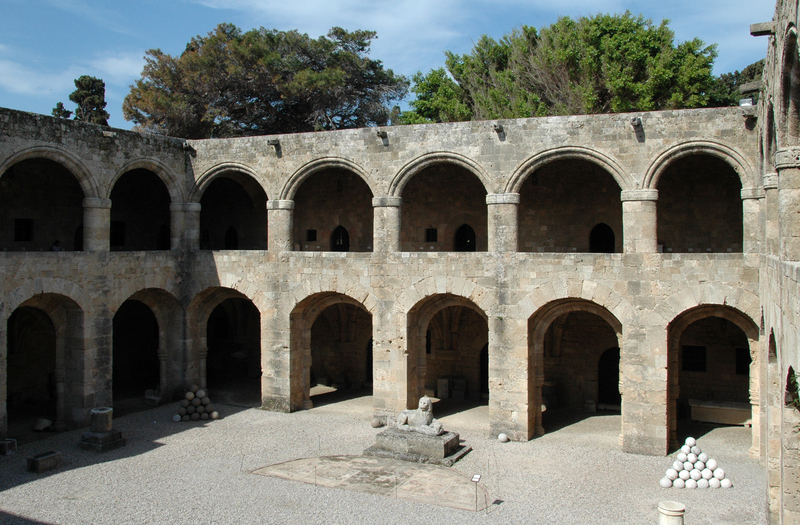 The Knights had not forgotten the original purpose of their Order hospital: they built one of the most imposing buildings of Rhodes as a hospital. 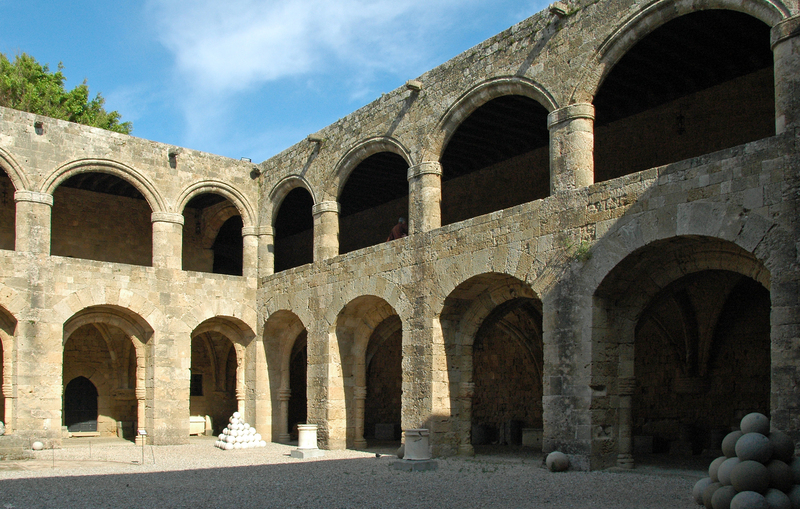 The construction of this beautiful and imposing building was decided by Antoine Fluvian River (Grand Master from 1421 to 1437), but work did not start until three years after his death, in 1440, under the teaching of Jean de Lastic Bonpart (Grand Master from 1437 to 1454), and was not completed until 1489 by Pierre d’Aubusson (Grand Master from 1478 to 1505). 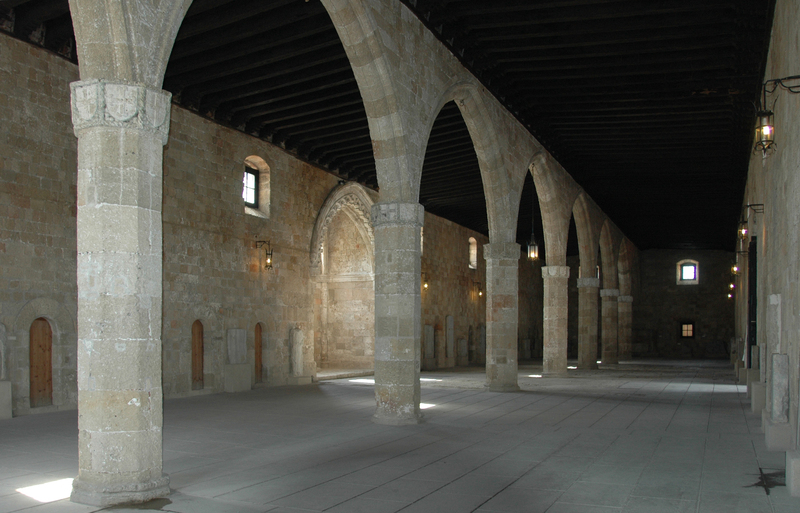 In 1522, patients came to the hospital with the knights to repel the invasion of Sultan Suleiman. 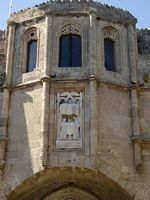 Above the front door, the back of the apse of the chapel of the great hall of the hospital as a salient and is adorned with a marble slab: two angels carry the arms of Fluvian . Under the banner of marble angels explained that the Grand Master Fluvian spent 10,000 guilders to build the building, the Gothic of the dedication are difficult to read because the lead that filled them was recovered by the Turks . 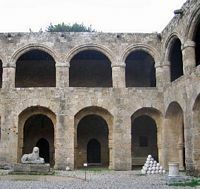 Damaged in the nineteenth century, the Italians restored the Great Hospital from 1913 to 1918 and turned into archaeological museum . 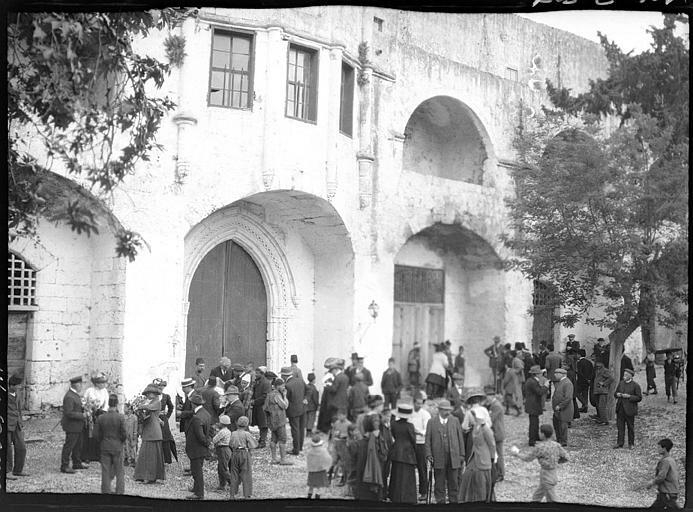 During World War II, the hospital of the Knights was hit by a bombardment English, and destroyed the refectory. 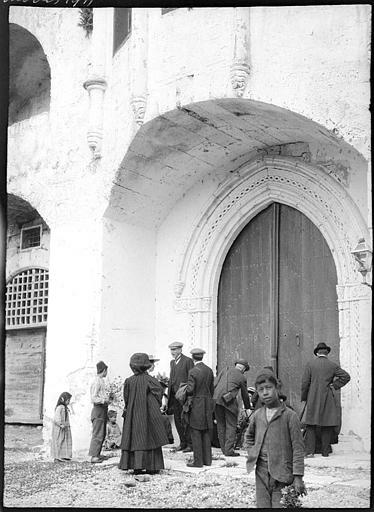 The wounded returning from fighting mainly against the Ottomans were housed and cared for. 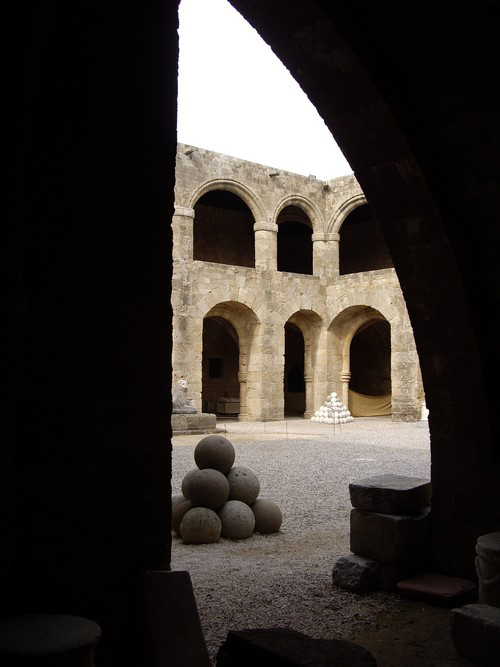 The first hospital has a great reputation, and the Knights of St. John were actually known for the quality of their medicine and hygiene: medical knowledge of the Hospitallers, was greatly enriched in contact with Arab medicine during the two centuries spent in the Holy Land. At Rhodes, they put their new knowledge into practice, innovative and often anticipating their time. The beds were individual - as opposed to use in Europe where patients occupied a bench for two - and closed heavy curtains to allow for a good rest. The patient received a sheet changed three times per week, a blanket, a coat and slippers. 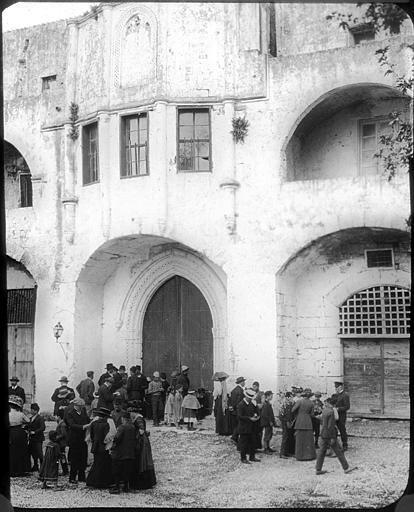 Distribution of white bread was not dictated by a taste of luxury, as has sometimes been claimed, but dietary criteria, as well as the use of silver tableware, with benefits for asepsis. Order surgeons operate in two patients. Important preventive measures are applied against infection and disease. Upon entering the hospital, patients must take a bath to reduce the risk of contagion. There are some rooms where patients are isolated from others. The Order may issue instructions during severe quarantine the spread of plague and cholera. Every great teacher perfects the rules decided by his predecessor. Everything is detailed, since the number of doctors to the number of cotton sheets. Each language must send various drugs. Patients Christians should confess and surrender their will to the prior. The Order built modern hospitals outside Rhodes, as at Corinth, Saint-Samson and Negroponte. 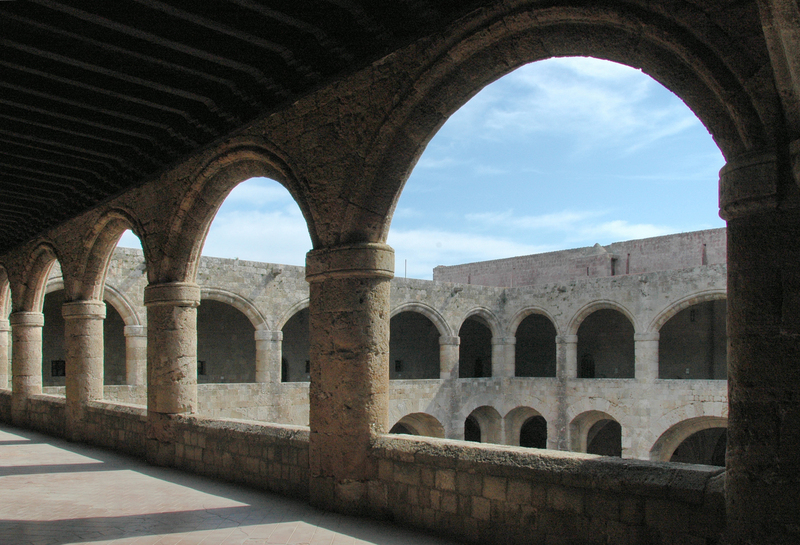 The hospital of the Knights is built around a large courtyard surrounded by two sets of superimposed galleries containing rib vaults resting on bases carved Romanesque. 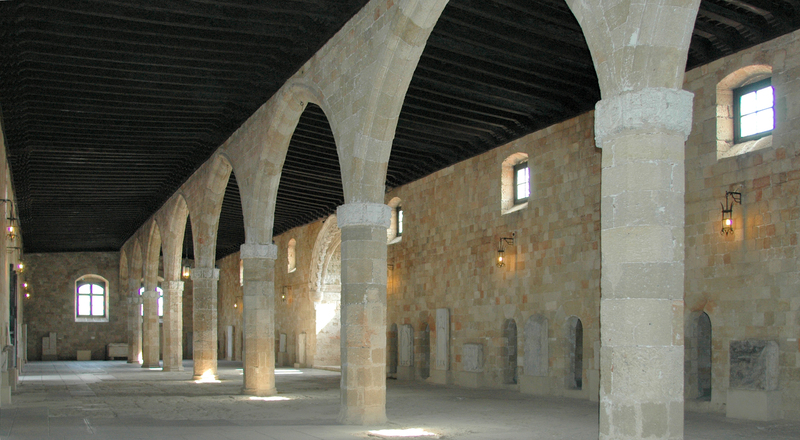 Access to the courtyard with seven arches supporting a vaulted gallery warheads. Store occupied the rooms on the ground floor, closed to the public, these rooms serve as a repository for antiques not yet classified. A staircase leads upstairs where there was the hospital itself, led by the bailiff of the language of France. 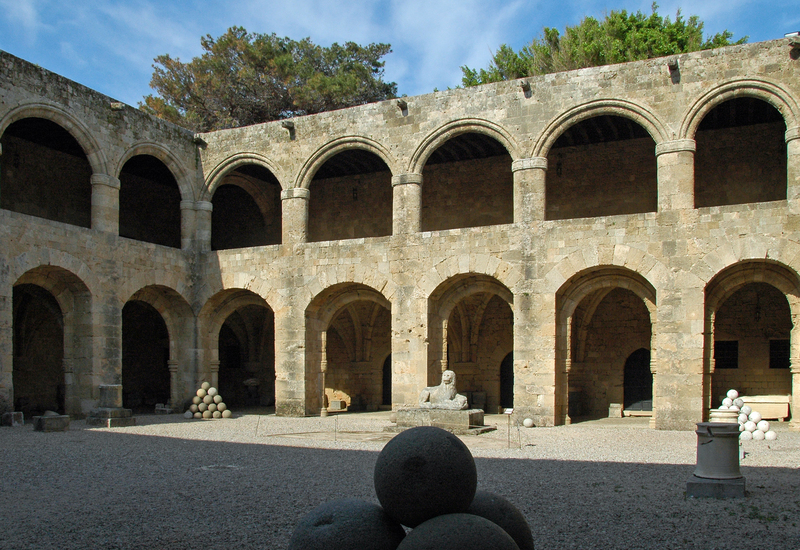 In the middle of the gallery to the left, up the stairs, opens the great room of the Sick. 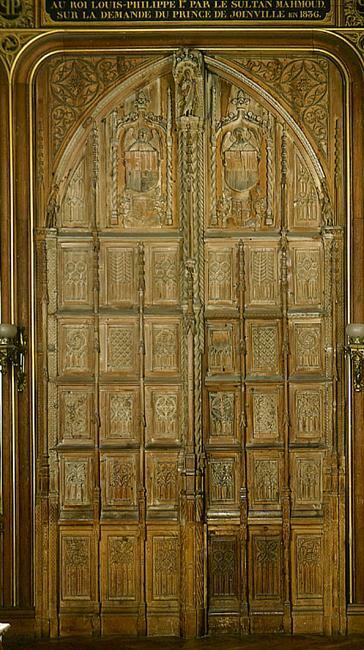 It is divided into two aisles by a row of seven octagonal pillars decorated with the coat of arms of the Grand Master Pierre d’Aubusson and various masters and dignitaries. 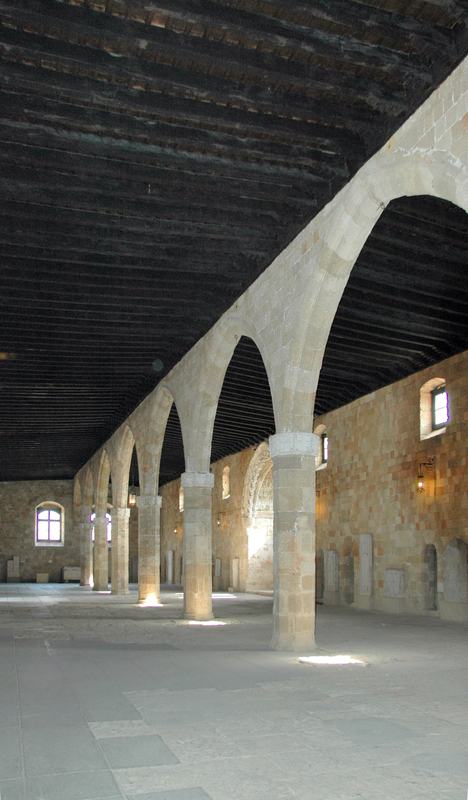 Equipped with cedar doors and covered with a ceiling of the same wood, the great hall of the Sick group housed 32 beds and could receive a hundred patients. 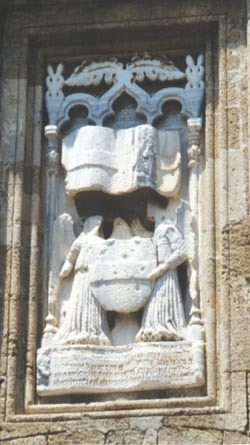 We are together tombstones of knights from the Church of St. John . 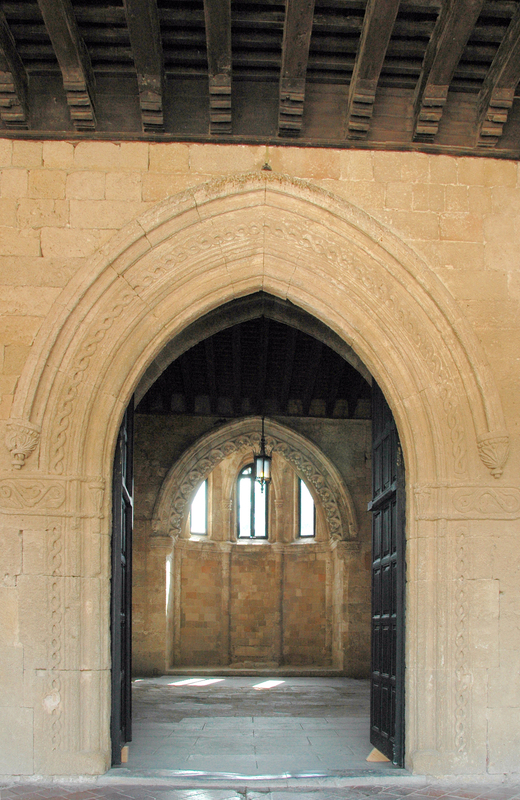 In front of the entrance to the hall, we can see the bow head, delicately carved, small chapel projecting out above the porch. 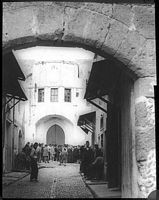 Small doors on the wall that can be seen behind the central arch gave access to the cells where they settled in patients with infectious diseases. Other parts of the gallery on the first floor were fitted for stewardship and "apothecary" of the hospital. 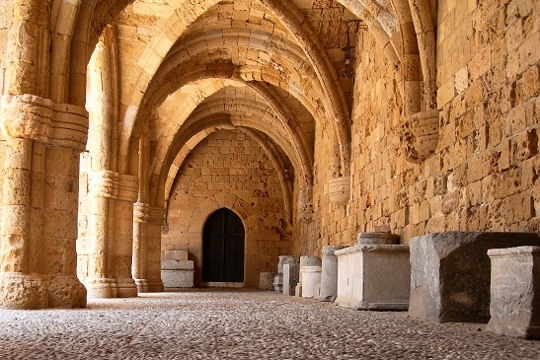 Brothers and servants assigned Knights to serve the sick (they belonged primarily to the language of France) it had small individual cells now converted into showrooms archaeological pieces. The other rooms on the floor were the dining room, large room whose roof is supported by two arches, also called two apses room, kitchen and a small hanging garden. 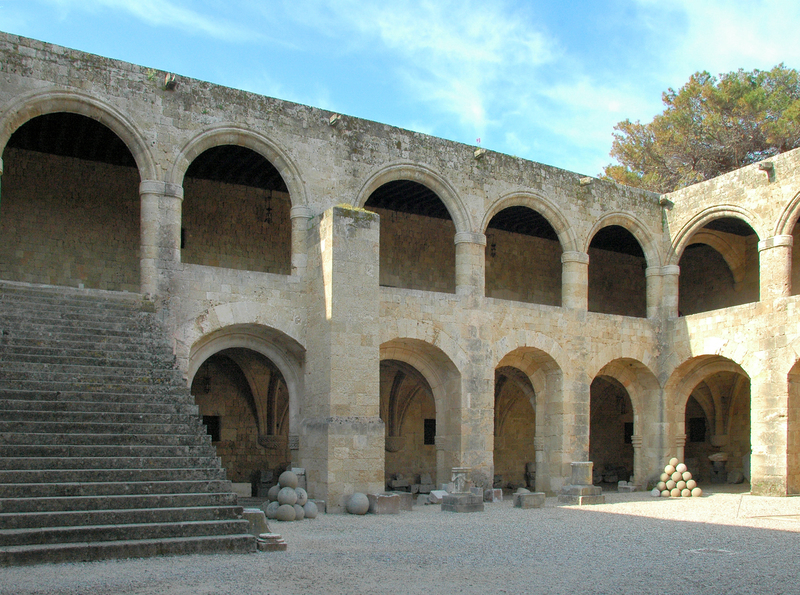 Tours every day except Monday, from 8 h 30 to 14 h 30.